← What the heck is Pilaf anyway? I’m coughing my brains out. I told C this morning that maybe I can count this as exercise? I’m feelin’ the Abs of STEEEEEEEL! I went grocery shopping today, so for dinner tonight I wanted to use up stuff in the fridge and off the counter. 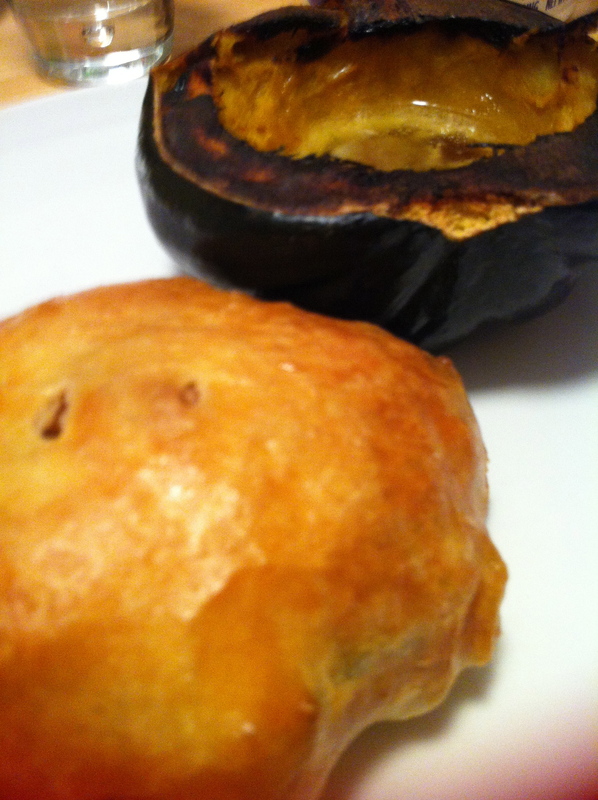 Roasted Acorn Squash with Butter and Brown Sugar alongside Chicken and Roasted Vegetable turnovers. 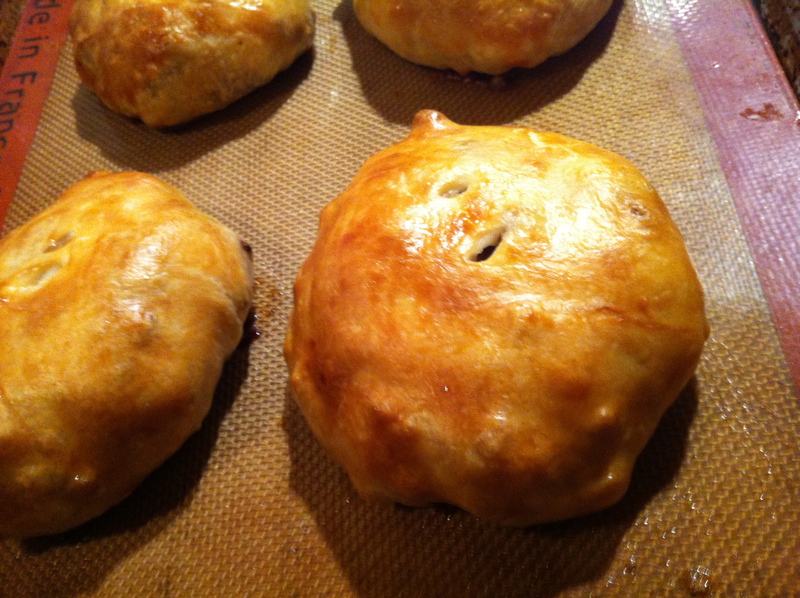 I made those by defrosting a sheet of puff pastry, rolling that out and then dividing it into 4 squares. 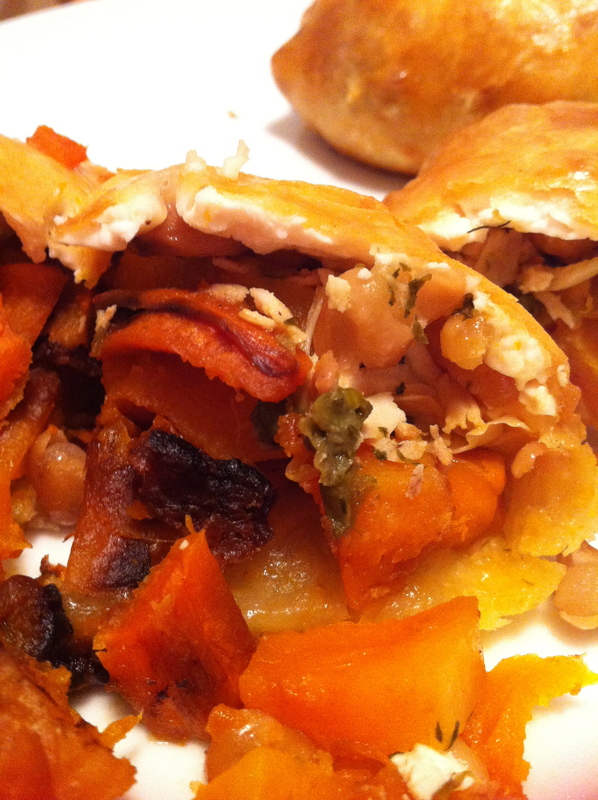 I shmeared each square with some Tofutti Cream Cheese*, topped with a couple of sweet cloves of confit’d garlic, some leftover roasted veg (carrots, beans and butternut squash) and then some leftover chicken breasts I shredded into bite-sized bits. Wrapped the whole thing up in a pretty little bundle, flipped them over and gave them a little egg wash (egg + garlic oil) and then whacked the pan in a 400° for 30 minutes. I had already put the acorn squash (cut in 1/2, seeds scooped out, cut side down on a baking sheet) in the oven when I turned it on. Here’s the rundown: I thought it was a stellar dinner! I ate my turnover and 3/4 of a 2nd one. C thought it was good, but the cream cheese was superflous (ate only 1). R ate most of my Squash and J had… Cheerios for dinner. *sigh* Can’t win them all. At least they ate something. *I used Tofutti cream cheese because: a) it seems like most savory turnover recipes include some sort of melty cheese and b) we were having a meat meal, which necessitates the use of non-dairy cheese substitutes. You can now go Google Kosher Definition, read my meMeme page, or just nod your head and keep reading. 2- Cut squash in 1/2, scoop out seeds. 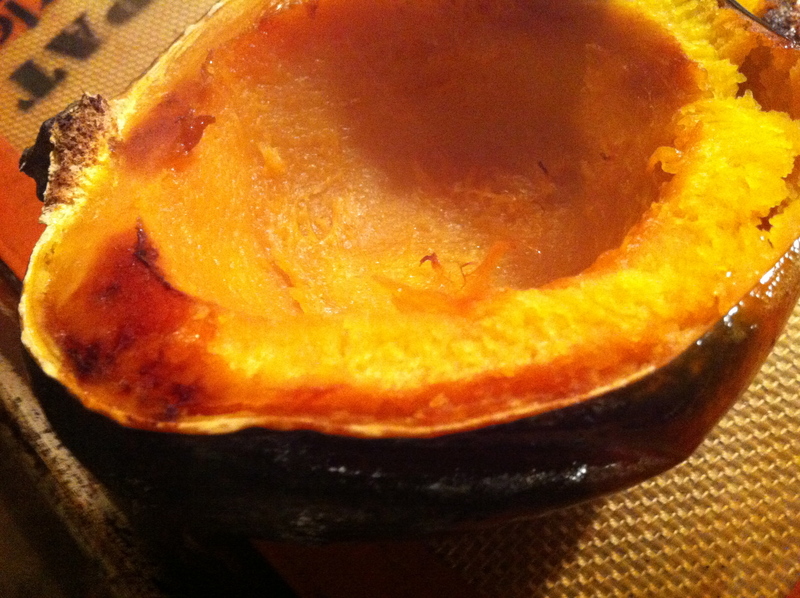 3- Put squash cut side down and bake for about 30 minutes, til skin can easily be pierced with a sharp knife. 4- Flip over, add 1/2T butter/margarine in each half. Add 1/2T brown sugar in each half (1T total). Heat of squash will melt butter and brown sugar. 3- Mound on 1/4 of veg and 1/4 chicken. Wash your greasy hands off. 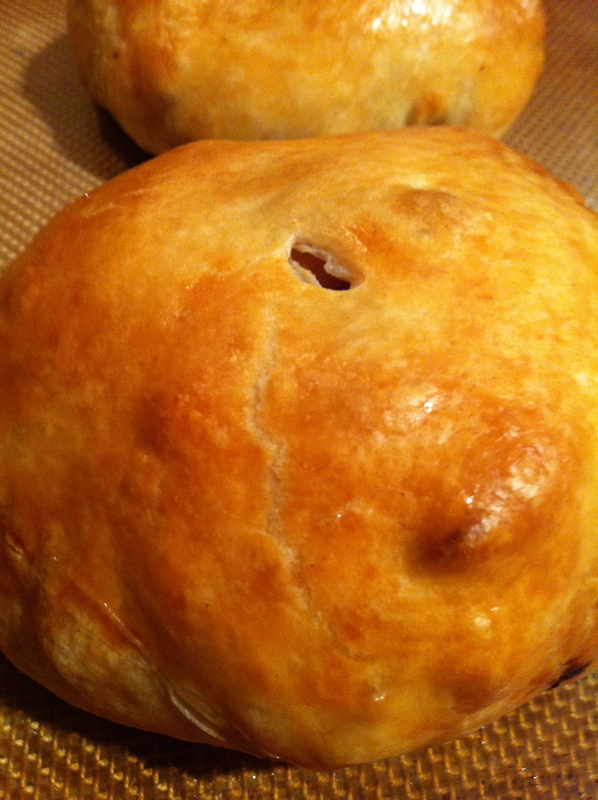 4- Wrap the pastry up around the filling, flip it over so the seam is on the bottom. 5- Brush with egg wash, make little slits in the top. 6- Pop into hot oven for 30 minutes. Can you smell my joy? 7- Don’t burn your mouth!